The new products feature the same flexible yet robust thermoplastic elastomer (TPE) housing of the previously released UHF SlimFlex™ Tags but, leveraging the NXP ICODE SLIX chip, can be read with any ISO 15693 compliant NFC smartphone, besides all the ISO 15693 RFID readers in the market. The SlimFlex™ Tag 200 HF is specifically conceived for tracking industrial assets with curved or irregular surfaces. Easily mounted vertical to any surface by means of a cable tie, or fixed onto any non-metallic surface with industrial glue, screws or rivets, this ISO 15693 NFC industrial tag is rugged enough to accompany assets that undergo harsh conditions during their whole life cycle. 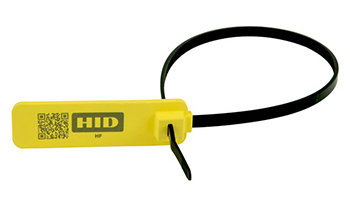 Featuring an integrated tamper-evident cable tie, the SlimFlex™ Seal Tag HF is designed to track industrial containers while protecting their content. This durable ISO 15693 NFC seal is an excellent solution for containers as industrial bags and sacks, beverage kegs, reusable shipping vessels, cartons and canisters, hazardous waste receptacles, gas cylinders, fire extinguishers. As they can be read also with NFC-enabled smartphones, the SlimFlex™ Tag 200 HF and SlimFlex™ Seal Tag HF offer the opportunity to save the costs related to the purchase of dedicated RFID readers. 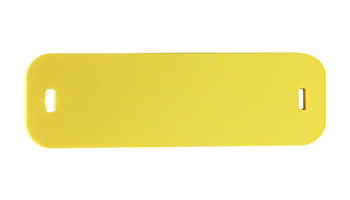 The standard color is yellow Pantone 108 to grant high visibility and excellent contrast when these tags are laser-engraved with custom barcodes, numbering, text or logo. The SlimFlex™ Tag 200 HF and SlimFlex™ Seal Tag HF withstand many aggressive chemicals, demanding mechanical and thermal stresses, prolonged immersion in water and exposure to UV rays. They are also food compatible for being used in food industry. Please contact HID Global for additional information on these industrial NFC tags. Looking for other kinds of RFID tags or complete RFID solutions? Try our RFID tag search engine or contact us.